University Square is just minutes from Southend town centre and all its facilities - everything is on your doorstep. University Square video transcript (.pdf). University Square accommodation on Vimeo. Photos of University Square on Flickr. University Square accommodation is perfectly placed to enjoy the many attractions and facilities Southend has to offer. There are seven houses around a central enclosed courtyard and each contain flats for eight to ten students, with shared kitchens. New Southend students two and three year accommodation deals for 2019-20. There is also a selection of self-contained studio flats suitable for either single or couple occupancy, with their own kitchenette and en suite bathroom. There are a number of studio flats adapted for wheelchair users. Meet other new students living in University Square on Facebook. Southend House 1 Facebook group. Southend House 2 Facebook group. Southend House 3 Facebook group. Southend House 4 Facebook group. Southend House 5 Facebook group. Southend House 6 Facebook group. Southend House 7 Facebook group. Our 360 degree virtual tours and videos help you to explore our Colchester and Southend Campuses from the comfort of your home. 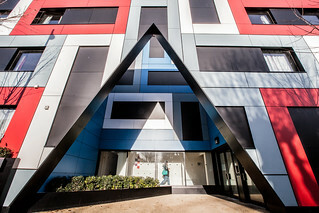 Check out our accommodation options, facilities and social spaces. Book a place at our undergraduate Open Day. Our department and admissions staff can answer any questions you have, and you can speak to current students about life at Essex while taking a campus tour. Why not find out what life at Essex is really like? See more of our campuses, facilities and accommodation and hear from our students and academics about what it's like to study with us. We understand that choosing a university for your studies is a whole new experience, so we’d be happy to arrange a campus tour for you guided by a current Essex student to get to know our campus.